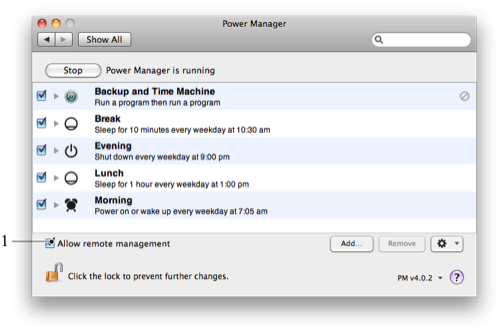 To allow Power Manager Remote to securely connect to your Mac, you must first enable remote management. Remote management is built into Power Manager for macOS. Enable ( ) the Allow remote management check box. Your Mac is now set up and ready to be remotely managed. With remote management enabled, Power Manager will accept incoming connections and additionally advertise its availability on your network using Bonjour.